One of my earliest memories of jap chae was at a church gathering when my family and I attended a Korean church in Los Angeles. I must have been around 5 or 6 years old at the time. The church members frequently had gatherings and they always fed us well. These gatherings typically included jap chae, galbee (Korean barbecue), egg covered fried fish patties, rice (of course), and plenty of banchan (side dishes such as kimchee). I remember piling on a little bit of everything onto my flimsy paper plate because everything looked so delicious. 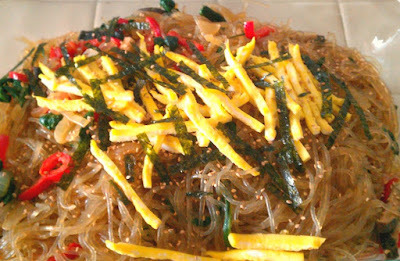 Jap chae was a staple at those gatherings and there was always plenty of it to go around. 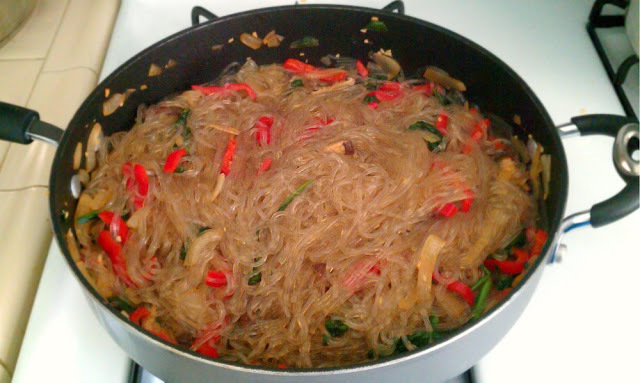 What is jap chae? It is a cellophane noodle dish mixed in with sautéed vegetables, mushrooms, and sesame oil. It is like the chow mein of Korea. It could be a side dish or the main course or even a snack. Although I’ve watched my mom make it before and I’ve bought it plenty of times ready-made at the Korean market, I decided to make it myself for Veggie Girl’s Fourth of July party. It’s really simple and although there are many varieties, I decided to make mine the way I like it. I think it turned out pretty good and my hubby thinks so too. I was able to fill an 11x13 pan with the following ingredients. 1. Prepare the noodles according to instructions. I used half a bag, which was plenty for our party. Drain and rinse the noodles in cold water to prevent from further cooking and set aside. Add a drop of sesame oil to the drained noodles and tossed it to prevent the noodles from sticking. 2. Cut off the stems of the spinach. Slice up the mushrooms, onion, and red bell pepper. In a large frying pan, sauté the mushrooms, onion, and bell pepper adding the garlic, soy sauce, and sugar for flavor. sauté until the vegetables are cooked but slightly firm and set aside. You don’t want overcooked vegetables for this dish. I sautéed the spinach separately in sesame oil since this cooks differently from the other vegetables. 3. Turn off the heat. Mix in the cooked noodles and vegetables in the frying pan and toss it with a pair of tongs or chopsticks adding more sesame oil and soy sauce as needed. I like mine with a little extra oil since the sesame flavor makes it oh so delicious. This is optional but I added a chopped fried omelet, shredded Korean roasted seaweed, and sprinkled some toasted sesame seeds for garnish as you can see. Enjoy! It's very common at almost any Korean restaurant. I love it any time of day.